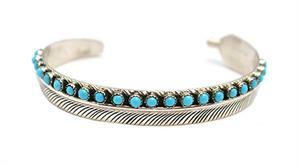 Sterling silver feather design bracelet with 22-3mm dot turquoise stones set on one side of the feather. It measures approximately 3/8" wide and tapers to the feather tip on one end and has the feather wrap on the other end. It is Navajo hand made by Aaron Davis. Color shade of turquoise may vary.